Opium poppy is an annual plant which grows about 1-4 feet high; its 4 petaled white or red flowers are tinged with blue and grow to 4 inches in diameter. Recognize the seedling when they appear in the spring by the blue-gray color of the leaves. It requires a long growing season, and cannot be matured in the north unless plants are started indoors. The roots are very sensitive and resent transplanting. The seedpods are large, follow the blossoms, and mature to golf-ball size. 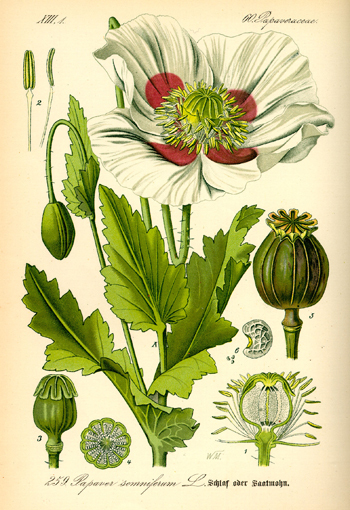 Opium poppy is very short-lived: seedlings appear in early spring, flowers bloom in midspring, and plants see seeds in late spring and are usually gone by summer. Different varieties have single, double, carnation, or peony forms. Native to Greece and the Orient. Opium is an addicting, narcotic drug prepared from the juice of the unripe seed capsules. It contains such alkaloids as morphine, codeine, and papaverine, and is used as an intoxicant and medicinally to relieve pain and produce sleep. The word somniferum means “to make sleep”. A variety of poppy with very flavorful seed has been developed by the Dutch from a combination of Papaver somniferum and P. rhoeas, the corn poppy. This poppy is widely grown in India, Turkey, and Persia, both for seed and for opium. The seed does not retain any of the narcotic properties, which are present only in the green seed pod. Poppy seed is used principally for baked products of all kinds. It is one of the main ingredients of commercial birdseed mixtures. Oil from crushed seed is used as a substitute for olive oil. Everyone knows of the misuse of opium; no need to detail that here. Pods should be allowed to dry on the plant, but must be caught before they turn their saltcellar-like openings to the ground to spill their seed. Drying can be finished on muslin indoors. When the pods are crisp, seed may be removed by rubbing the pods between the palms. The tiny seed can be separated from the chaff by putting it in a coarse strainer and shaking. This plant under proper medical supervision is highly valuable. Opium is addictive and overdose is fatal. Never use without medical advice.